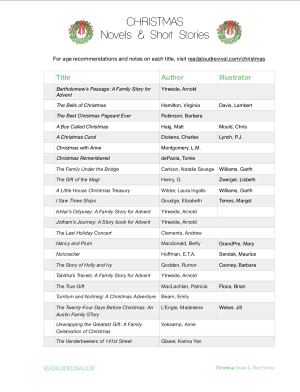 You’ve been asking for one, and this year, we made it for you: a booklist of Christmas novels to read aloud. If you’re looking for stories that will shape and form your Advent and Christmas season, you’re in exactly the right place. On this brand new podcast episode, I’m sharing my favorite Christmas novels (and short stories, too) to read with your kids. Best for all ages. This is one of Sarah's favorite read-alouds. Armand does not want children, but the family under the bridge needs him. A heartwarming Parisian tale and a Newberry Honor book. Perfect for Christmas. Best for all ages. A classic! One to buy for your own shelves. Best for ages 7+, and highly recommended. The 1st book in Arnold Ytreeide's fantastic Advent series. This is one of Sarah's favorites. Preview for sensitive readers, as these stories get quite intense. They are also rich and beautiful and unforgettable. Best for ages 7+, and highly recommended. The 2nd book in Arnold Ytreeide's fantastic Advent series. This is one of Sarah's favorites. Preview for sensitive readers, as these stories get quite intense. They are also rich and beautiful and unforgettable. Best for ages 7+, and highly recommended. The 3rd book in Arnold Ytreeide's fantastic Advent series. This is one of Sarah's favorites. Preview for sensitive readers, as these stories get quite intense. They are also rich and beautiful and unforgettable. Best for all ages, and one of Sarah's all-time favorite read-alouds. Join the Vanderbeeker kids as they try to convince the curmudgeonly landlord, Mr. Beiderman, to renew their lease and let them stay in the brownstone they all love. Best for all ages. The Christmas scenes from the various books in the Little House on the Prairie series, all in once place, and illustrated by Garth Williams. Best for all ages. If you love Anne of Green Gables and Lucy Maud Montgomery, this one is not to miss. A collection of stories from LM Montgomery's books. Best for ages 7+, and highly recommended. The 4th book in Arnold Ytreeide's fantastic Advent series. This is one of Sarah's favorites. Preview for sensitive readers, as these stories get quite intense. They are also rich and beautiful and unforgettable. Best for ages 4+, including your teens! This is a long one, so read it like it's a chapter book. Maurice Sendak's illustrations are just marvelous! Best for ages 7+ if your kids are into classics. This one is a bit more "classic" in style (spare, beautiful language and a slower-paced, but rich, story), this is Elizabeth Goudge's imagining of the Christmas carol, I Saw Three Ships. Best for ages 5+. Your kids don't need to be familiar with the other Tumtum and Nutmeg stories to enjoy this one. But they may fall in love with Rose Cottage after this one! Best for 6+, but everyone could listen in. A classic Christmas tale by the author of the Mrs. Piggle Wiggle books. Orphan sisters, the horrid Mrs. Monday, and Christmas shenanigans. There's a lot to love about this one. Best for 8-12 as a read-alone. Andrew Clements delights kids once again with this school story. In this one, the most popular kid in sixth grade discovers what it means to be a leader. Best for ages 5+. I was surprised at how much all of my kids enjoyed this when we read it a few years ago! The American Girl "Surprise" books that celebrate Christmas are really quite delightful. Best for ages 6+. Older kids and teens will enjoy this one a lot-- so will you, mama. It's the classic tale from O. Henry, and I like this edition as well as the one illustrated by P.J. Lynch. Best for ages 6+. Older kids and teens will enjoy this one a lot-- so will you, mama. It's the classic tale from O. Henry, and I like this edition as well as the one illustrated by Lisbeth Zwerger. Best for ages 7+. A bit slower-paced, so this one is best for your patient listeners. Twelve-year-old Jason Bell and his family anticipate Christmas in Ohio, 1890. Best for ages 8+. Hilarious and moving, this one is a Christmas classic! Best for ages 8-12. Tomie dePaola is always a RAR favorite! In this collection, he recalls memories from his own Christmases. Best for all ages. This is an Advent celebration of the Jesse Tree. Read a little bit aloud each day, if you can. Best for ages 8-14, though all ages could listen in. The Austin family does one special thing each day of December to prepare for Christmas. This year, they're also preparing for the birth of a new brother or sister!